Is it a bird? Is it a …..
butterfly? Is it a fish? No, it is all three and a batik as well. 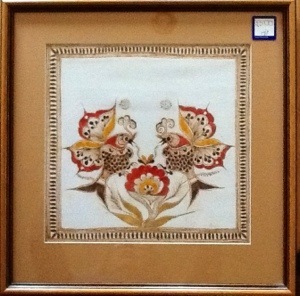 I found this lovely batik in a local charity shop and it cost just £5. Was it a holiday souvenir I wonder? Not knowing very much about Indonesia I don’t know if this bird/butterfly/fish is a mythical creature from Indonesian culture or a figment of the artist’s imagination. What I did find out is that the art of batik has been declared by UNESCO as a Masterpiece of the Oral and Intangible Heritage of Humanity. It is also considered to be an art as well as a craft and I hope that someone in Chipping Norton will feel the same and give it a new home where it can be appreciated for being all of these things.